As we slowly make our way towards spring and its prospects for Bike Fun, I want to update Poky Pedalers on planning efforts for this year’s Poky Pedals. The 2015 Bike Fun Calendar is shaping up very nicely. I may still tweak a detail or two, but the collection of Poky Pedals running from May through early fall is pretty much set. The full 2015 Bike Fun Calendar will be released on the PPSP website in early April. I won’t give away too many specifics here, but I do want to give some impressions about what Poky Pedalers can expect. As I posted in December, I have some personal family issues that will occasionally require me to be away from Stevens Point for a few weeks at a time. Unfortunately this will affect PPSP, and the schedule of Poky Pedals will be a bit less regular than in past years. Nevertheless, a record number of Poky Pedals is planned for this year – more than the 13 Poky Pedals from 2014. There will be enough of the usual mix of old favorites and new themes to quench the Bike Fun thirst of all Poky Pedalers. Among the old favorites, Poky Pedalers can look forward to another season full of Poky Pizza Pedals and Poky Pedaling Potluck Picnics. These popular rides will be complemented by a new series of monthly Friday evening Poky Pedals that should have particular appeal to those with a sweet tooth. There will also be the typical collection of monthly Saturday afternoon rides. As usual, there will be an encore from 2014 to give Poky Pedalers a second chance at a notable ride from last year. Our final Poky Pedal, as always, will be the Maple Ride. 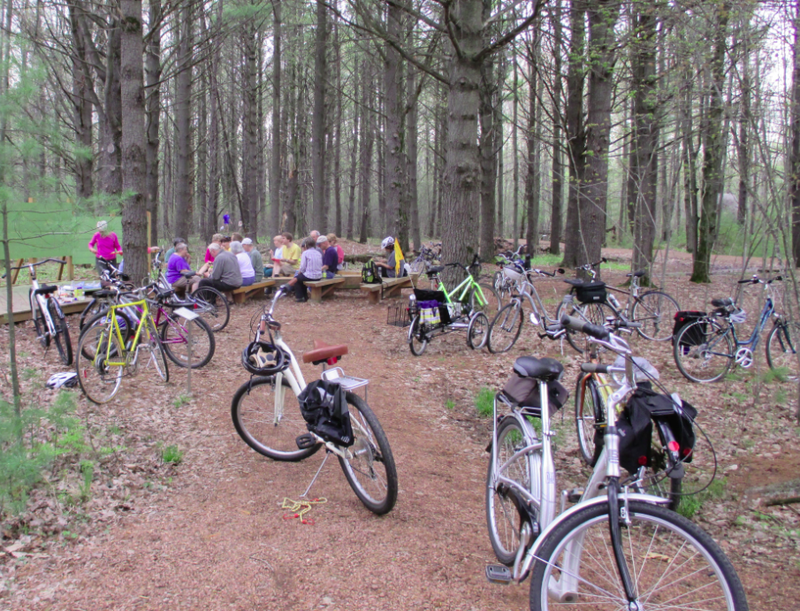 As a new twist on the Maple Ride, I’m thinking about having a PPSP Bike Fun Banquet at a local establishment immediately after completing that ride. This will be a great opportunity for Poky Pedalers to gather and look back on all the Bike Fun we shared. Keep tabs on the PPSP blog as fall approaches for more details about this. The Saturday Poky Pedal in May should be of particular interest. 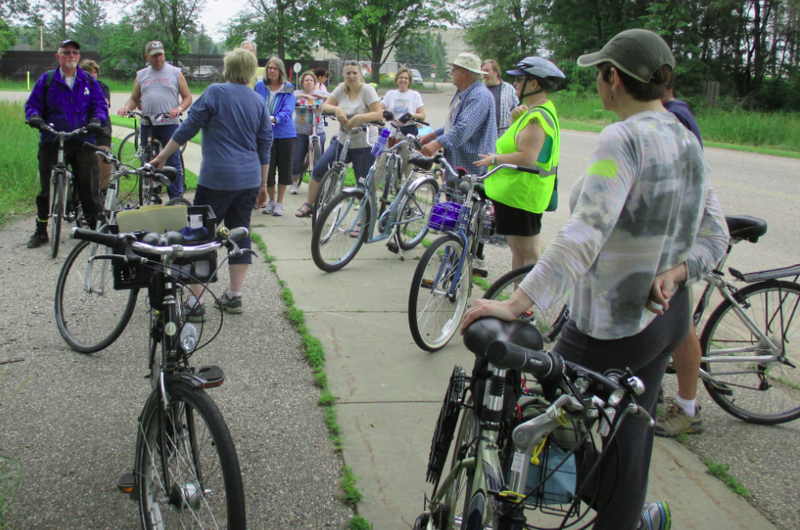 It will complement the efforts of those promoting Bike to Work Day and Bike to School Day, which raise awareness of bicycling for transportation. Yet our Poky Pedal’s theme will deviate from that of those events. And it will involve playing Bingo. Now that your curiosity has been aroused, watch for the unveiling of the 2015 Bike Fun Calendar to learn more. In case all this isn’t enough to fan your inner Bike Fun flames to get you through winter, it is extremely likely that PPSP bike “bumper” stickers will be handed out during this year’s Poky Pedals. With these new freebies from PPSP, your bicycle will be able to spread the spirit of Bike Fun while telling the world that Poky Pedalers are everywhere. There is definitely a ton of Bike Fun to look forward to in 2015. As you view the piles of snow out your window, allow your anticipation of the 2015 Bike Fun Calendar – the April release is coming fast – to help you envision it all melting away. Budding trees and sprouting tulips will serve as the backdrop for sharing loads of Bike Fun with Poky Pedalers for months to come.